According to National Geographic, ninety-nine percent of the population of the U.S. and Europe can’t see the Milky Way from their homes. That makes many of us here on the Western Slope very special! Feels good to be part of the one percent, doesn’t it? Not only can the Milky Way be seen locally, but our dark skies can provide wonderful unaided views of planets, constellations, the Moon, stars, and stars forming patterns called asterisms, like The Big Dipper and The Northern Cross. But imagine what you can see through a telescope? On Saturday, May 12, the Black Canyon Astronomical Society will be showcasing our Western Slope night skies with a “learn to use your scope” and public viewing event at Orchard City Town Park. This outreach is free and open to the community. From 6 to 7 p.m., BCAS club members will be on hand to answer equipment questions and give astronomy-related advice. If you have a telescope and want to learn more about it, please arrive by 6 p.m. Viewing starts at dusk, when the planets Venus and Jupiter make their appearance. As twilight darkens, telescopes and binoculars will unveil objects in the night sky like moons around Jupiter, nebulae, double stars, star clusters and galaxies. Green laser constellation tours will also be available. 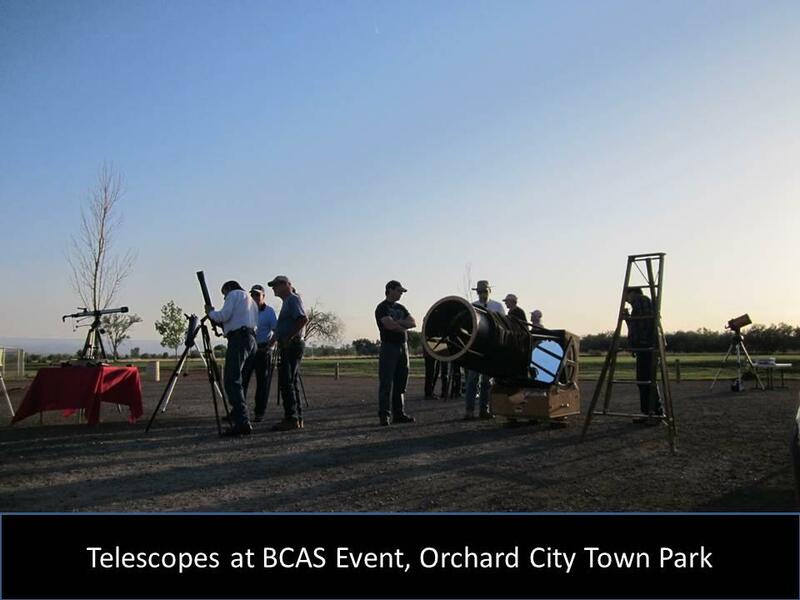 Courtesy of the Town of Orchard City, the BCAS will be setting up their astronomical equipment in the south parking lot adjacent to the Field of Dreams. Please park facing away from the telescope area, and use care with white lights around the amateur astronomers and visitors. Red lights work best for preserving night vision. The event is weather dependent, so hope for good weather and clear skies! The Town Park is located at 11245 2100 Road, Orchard City, 81410. Please call (970) 589-0993 or 856-7716 for more information. Don’t miss this special opportunity to “Enjoy the Night Sky at Orchard City Town Park” on Saturday, May 12th!